Thanksgiving is upon us and we’ve got you covered. Passing Pumpkins is a simple and fun group game to play with your friends or family for Thanksgiving. Really, you can use this game any time during the fall or even during the Halloween season next year. It’s guaranteed to get your group up and moving and fill the room with plenty of laughs. Here’s how Passing Pumpkins works. 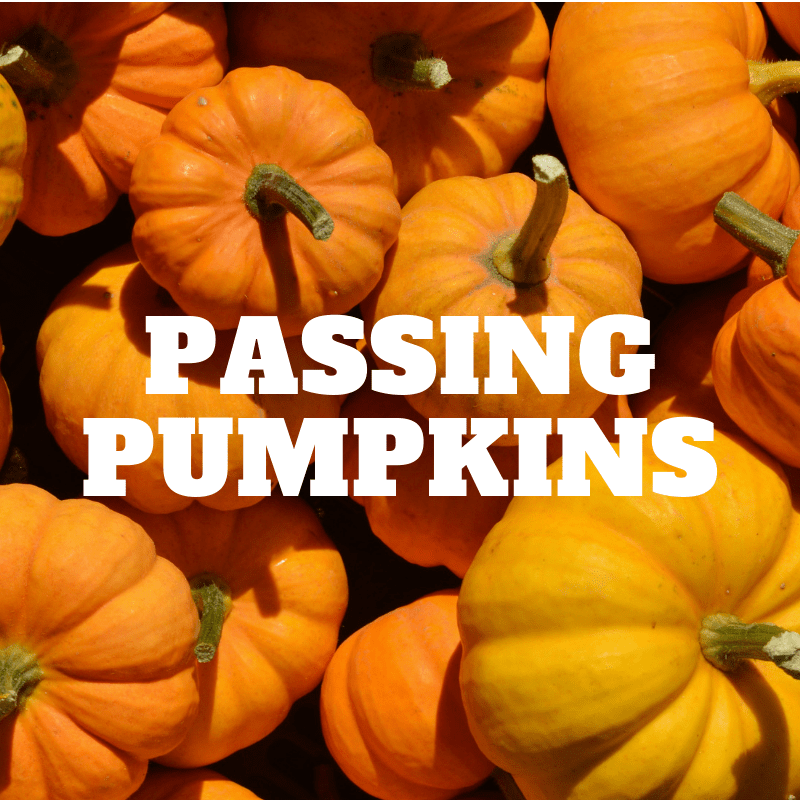 Passing Pumpkins is pretty much what it sounds like. If space allows, have teams stand in a circle so they are all facing each other. If you’re tight on space, have them stand in a single file line. Once everyone is in position, hand one person on the team a mini pumpkin and explain that the goal of the team is to pass the pumpkin around the circle as quickly as possible until it reaches the person it began with. The team to do so first wins. Ah, but we can never make it that simple at stumingames.com. Mix it up by telling them they can’t use their hands for the game. This will allow them to get creative with passing techniques. Your other option is to give them a method for passing. Some suggestions for passing pumpkins are: feet only, under your chin, elbows only, knees only, or whatever your mind can conceive! Pick your favorite, or if you have a smaller group, use multiple methods and race against each other. By the way, if they drop the pumpkin, they simply pick it up using the method you’ve listed- remember, no hands! Once teams start passing pumpkins, we can assure you that hilarity will ensue! 1. Have a few extra mini pumpkins on hand. They usually don’t split open, but it is possible. 2. Bust out the phone and go live or share your game on Snapchat or Instagram stories for everyone to see. 3. Spray paint a pumpkin with gold paint and award the team the “Golden Pumpkin” award. 4. Experiment with larger pumpkins if you really want to go big!